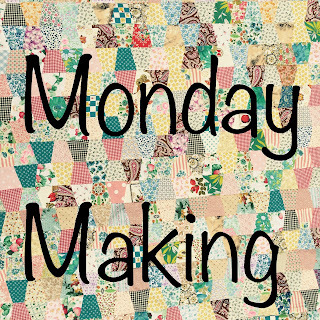 Welcome to the Monday Making party. I appreciate all of you who link up every week! I am adding blocks to this quilt I started a long time ago. and I thought I might join in the swap. using white cornerstones and background. Little by little a quilt will SOMEDAY be complete. I love the way you did matching alternate blocks. It really makes the quilt come alive. You should defitely finish this one! That's going to be a great scrappy quilt! I really like those blocks - they are really unique! I remember those barn door blocks! At the time I said I'd like to make a bunch more for myself. As with most Block Lotto blocks, that's what I always say! I remember making some of those blocks and, like Nann, was going to make some for myself but never did. Little by little, and slow and steady - you'll finally get this finished! It's still attractive. I'm glad you're continuing your progress.